Anyone following the field of robotics knows that there has been a recent explosion of development. Advances are being made in all areas from artificial intelligence to direct the robots to the ability to replicate human like movements. Walking and talking robots are being worked with in research laboratories all around the world. 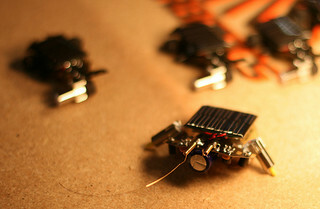 One of the main goals of robotics is to make robots small enough and light enough for practical use. Robotics engineers haven’t made a secret of their attempts to go smaller and smaller with robots. They openly admit to developing robots modeled on insects. The smallest functioning robots that we know about which could be used for spying are about the size of your hand. The most famous of these bots are the Quadrotors. These flying robots have four wings that rotate like the rotors of a helicopter. They have amazing flight capabilities and can move in formation. What’s Next For Inspect Spy Robots? Well, the Quadrotors have plans to go on tour with their shtick. Over years past, researchers reported success with increasingly smaller flying robots. Once the robots are capable of flight, they are able to fly overhead like reconnaissance drones, observing your every movement. Heck, they can even fly into your home disguised as flying cockroaches or even the tiniest fly. In 2009, researchers at a company called, AeroVironment managed to produce a Nano Aerial Vehicle (NAV) that looks like a bird flapping its wings in mid air. The small flying robots have been further developed since then. In 2011, DARPA released footage of a hummingbird bot capable of flying for twenty minutes and also recording video. Remember, this is from 2011. Technology advances at incredibly fast rates. Those hummingbird bots are probably hissing cockroach bots by now. So, next time you see a really giant hairy looking bug on the wall, think twice before swatting it. It may be a costly piece of government equipment. For your enjoyment, a swarm of modular robots.